This week's theme was time, and I was going to to try as hard as I could to not take a photo of a watch or clock. I did take one of a clock to use as backup, but then when I thought I'd have to use it there appeared Zoltar! 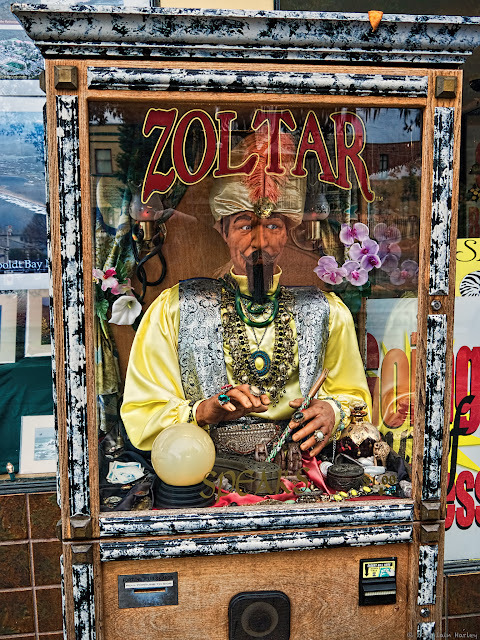 I hadn't seen an actual Zoltar machine before, except in the movie Big, so this was kind of neat. There's a website all about the machines, which start at $5,500 and can go to as high as $11,000! They're all hand made, which I suppose accounts for some of that price. A pretty cool thing to run into.